Hi, we're installing a 21' pool. We've removed the sod & have a 12 inch difference from one end to the other. We built a wall the circumference around the pool with cement pavers & have had sand delivered to make it level. We've tampered the sand. Will this be sufficient or will the sand shift? We are planning to put the post on cement blocks. Also does the frame need to be on pavers also or can it be on the sand. Just don't want any shifting. Thanks for any feedback!! Hi Luis. If it were me I would remove the sand and fill the area with something like a crusher run or crushed granite. The sand should only be a couple of inches for a cushion under the liner. If you decide to leave the sand I would definitely put the footplates and the bottom rails on blocks. Setting the entire frame on blocks might make it work. It would depend on the containment of the sand from the surrounding landscaping. You mentioned a retaining wall. If all the sand is well contained you will probably be OK. I have watched many pool installation videos and I see that they set up the rails on the dirt and the sand only goes in the middle of the pool (under the liner). Is that usually what is done? My question is if the rails are set up on the dirt and the sand isn't extended to under the rails and outside the perimeter of the pool wouldn't the dirt cause the rails to rust. I thought that there should be something under the rails such as sand or another material to prevent the dirt from being directly under the rails and directly touching the pool walls. Hi Ashley. What you have seen is correct. I level all the bottom rails and then bring in the sand. The sand goes in the center of the pool, several feet from the bottom rails. The sand gets spread out once the pool wall is up and secure. It is impossible to install a wall into bottom rails if you are working on sand. The wall will not roll on sand and the sand gets into the rails. 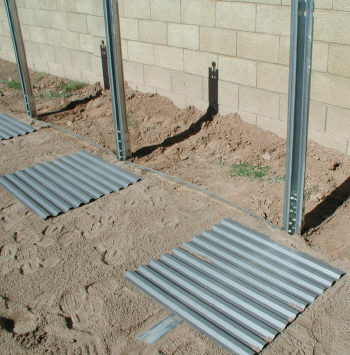 When sand or dirt fill the bottom rails the wall will not go in, it can become nearly impossible. You have to trust your pool manufacturer to treat the metal that will come into contact with the dirt. Typically the more expensive pools have the best coating, and therefore can offer the best warranties. A good quality pool should last well over ten years with no signs of rust. On the outside of the pool there is nothing wrong with laying out some black plastic and running it up the wall a few inches. Cover the plastic with some decorative stone and you have the perfect pool landscaping. I'm installing a 21' above ground pool. Using a transit, I discovered that the area where I want to place the pool is not very level at all. In fact, there is an 18" difference between the low side and the high side. I want to put the pool in and then build a deck from the back of my house to the edge of one side of the pool. If I dig out the low side 18", I will have to lower part of my deck. So, it would make life a lot easier if I can add soil to the low part so that I won't have to lower the height of my deck where it meets the pool railing. I do realize that I will have to rent a commercial compactor and really get the added dirt well-compacted, but is this a good idea? I can't find very much information on pools that have been installed on soil that has been built up 18" or more. Please advise!! Hi GB. I've done it many, many times. In your situation it makes perfect sense, to raise the pool level to the height that works with your deck plans. You do need to consider your soil conditions and be sure you have soil that can be safely compacted. If not you may consider ordering something like crushed granite from a local sand and rock company. That stuff really packs. In some areas it's called crusher run. Having soil that will compact is a must, as opposed to sand, or sandy soil, which does not compact. Your second consideration is the ledge you build beyond your pool. If you are raising the pool area try to go at least three feet past the pool edge. The more ledge you add the better. Then you need to consider the landscaping that will hold the ledge in place. Three foot beyond the pool to a straight three foot drop is probably not good, unless you have a block wall in place to prevent future erosion. When compacting the soil use a combination of water and tamping. It's a great combo. Water and pack the area, let it dry, and do it again. You do this until you feel good about your pool base. Anytime an above ground pool owner is planning a deck I want to make sure they know exactly how a new liner might need to be installed in their pool. The best way to install an overlap liner is to stretch it over the rails. A beaded liner is perfect for pools where the top rails cannot be removed. You might benefit from checking out these pages to be sure your deck plans work with future liner changes. We are replacing a steel pool because water issues caused it to shift and damaged it beyond repair. We are considering a 15x30 resin above ground pool. Hi D. Crusher run makes an excellent above ground pool base. It levels easily and then packs solid. Once the pool frame is installed I would use sand over the crusher run instead of foam. Oval pools have side braces that require a lot of extra attention. You will be digging trenches and packing soil back in around the braces. You will also be laying down pressure plates that stick up into the pool area. These plates need to be completely covered with dirt or sand. I prefer sand over the plates on oval pools; it just seams to work better. I built a 15 x 30 foot oval for myself one time and used Styrofoam sheets. Since it was for myself, and I could experiment, here is what I did. I had the foam from a pool I had taken down for a customer. I also had a few extra sidewalls around. I set the braces up, then I cut a piece of 48 inch steel sidewall the length needed to completely cover the brace assemblies going down each side. So I had two pieces of sidewall about 4' x 20' covering the brace channels on each side of the pool, on the inside of the pool. The sidewalls created a flat surface that I could easily put the foam sheets over. They also collected the weight of the water and held the braces in place and kept them from bowing outwards at the tops. So unless you want to get creative you may want to stay away from the foam sheets. Take a few minutes and review these two oval pools being set up, you may come up with some more ideas.